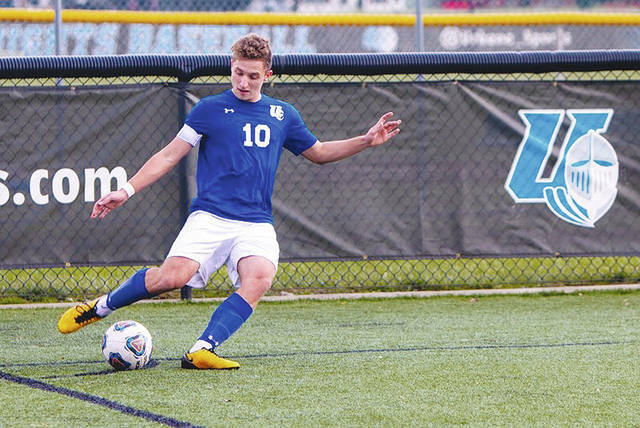 UU’s Jasminko Dizdarevic (pictured) has been voted to the Division II Conference Commissioners Association (D2CCA) Men’s Soccer All-Atlantic Region Team. Urbana University’s Jasminko Dizdarevic has been voted to the Division II Conference Commissioners Association (D2CCA) Men’s Soccer All-Atlantic Region Team. Dizdarevic, a junior from St. Charles, Ill., is one of five midfielders appearing on the D2CCA All-Atlantic Second Team. He led UU with 17 points and eight goals this season including two game-winners and three multi-goal outings. Dizdarevic was recently named to the All-MEC First Team after helping the Blue Knights finish 8-7-3 overall. Dizdarevic and teammate Zach Poff were named All-MEC First Team in men’s soccer. The D2CCA encourages and promotes Division II athletics and high standards of sportsmanship as important elements of higher education. The CCA is a key communications link among the conferences as they discuss views, policies and regulations that impact Division II intercollegiate athletics and works closely with the NCAA as a communications channel to NCAA Division II member colleges and universities. UU’s Alyssa Edwards and Jordin Littles have earned honors from the Mountain East Conference as the league announced its annual women’s soccer awards and all-conference teams. Edwards, a sophomore from Canal Winchester, Ohio, landed on the All-MEC Second Team after tallying a team-high 17 points in 16 matches this fall. Her eight goals led the Blue Knights and ranked her third among conference leaders. She also netted the second-most game-winners among MEC players with three on the season. Edwards was named honorable mention as a freshman. Littles, a junior from Cincinnati, Ohio, appeared on the All-MEC Honorable Mention list for the second time in her career. The midfielder, who is one of the team’s best passers, started all 16 matches and finished fourth on the team in points with one goal and one assist on the year. She was also named honorable mention as a freshman.